In January 2019, new car prices averaged $37,149 in the United States. That represents an almost $1,500 increase from January the year before! What’s more, you can expect to shell out no less than $41,000 for a brand-new pickup truck. Even used cars are becoming pricier, with their prices reaching $19,657 in the first quarter of 2018! Despite the ever-increasing prices though, Americans continue to invest in these machines. 79% of them say that they rather buy than lease one. And let’s face it — most of us need a car for daily transportation. Besides, car ownership can be less expensive by learning basic automobile mechanics. There are many troubleshooting and preventive steps you can do on your own to keep that cash in your pocket. Ready to learn auto mechanics and make your ride last for as long as possible? Then let’s get right into it! Before you can even carry out even the simplest auto repairs and upkeep, you need your car manual. If you haven’t read it yet, now’s the best time to, as it’s a treasure trove of information about your ride’s specs and tech. It contains info specific to your car’s make, model, and year, from its specific parts to what’s under the hood. From there, you need to invest in basic but essential repair tools and supplies. Start with a screwdriver, plier, and wrench sets, which already come in varying sizes. Get a socket set that already includes standard and metric sized drivers and sockets too. Zip ties, lubricants, cleaners, drip pans, and electrical and duct tape are also a must. You should also invest in a tire pressure gauge and an automotive tester. These tools are necessary to troubleshoot tire pressure, engine, battery, and sensor problems. They’ll help you determine if the fix is easy or if it’s best to get your ride to a professional mechanic. To perform auto mechanic basics, first learn about common symptoms of automotive problems. By knowing why your car emits odd smells or sounds, you’ll have an easier time troubleshooting. Does your car smell like rotten eggs or moldy bread when you turn the AC on? If so, then that can be a sign of a malfunctioning AC accumulator. You likely need to get it replaced, but luckily, these parts aren’t that expensive. Rotten egg odors can also mean you have a bad catalytic converter. This is the part that converts pollutant and harmful gases into less dangerous ones. That said, be sure to fix or replace a faulty converter right away. A clicking noise from the engine often indicates worn out parts in the engine. It may also mean that you’re low on oil pressure. Especially if the clicks become louder as you continue to rev your engine. If you hear (and even feel) loud rumbling noises from your ride’s underside, a faulty muffler may be to blame. You may need to get a muffler or exhaust pipe replacement. Squeals that you hear when speeding up may mean a detached or old power steering. Whereas screeching sounds when putting on the brakes can mean worn brakes. Always keep your car fluids (oil, coolant, fuel, water, and brake) topped up. This’ll help prevent overheating, poor fuel economy, and instability. Most importantly, you can make sure your brakes work when you need them the most. Proper tire rotation, alignment, and pressure are vital for even wearing of your tires. Uneven wear can lead to bumpy rides and reduced mileage. Proper tire pressure also helps prevent blowouts, which can be a deadly situation. Always check your car battery, even if they usually last anywhere from three to five years. Your battery’s life span still depends on your driving habits and the environment. Once your battery turns two-years-old, start running regular charge tests on it. This diagnostic procedure will tell you if your battery is still good enough to run your ride. If it’s nearing the end of its service life, the tester will notify you, so you’ll have time to get it replaced. Basic auto mechanics also involve carrying out certain part replacements. But don’t worry, as many of them, like filter and oil changes, are quick and simple. Here are some of the easiest ones all newbie and learning mechanics can do on their own. Filthy air and fuel filters can reduce your car’s performance, power, and gas mileage. The good news is, both are some of the easiest (and cheapest) parts to replace. It’s best to change your air filter once every year, sooner if you live in a polluted area. Replacing a fuel filter should be after every 30,000 miles. Check your manual first though as it may have specific replacement instructions. For this, you need your toolkit’s ratchet, wrench, funnel, and drip pan. It’s also best done right before an oil filter change, so you should get a new filter. Make sure your car is cool and that it’s been resting for a few hours before changing the oil. Changing your oil on time is key to an efficient fuel system, which means better mileage. Letting dirty fuel run through your engine can rob it of its power and make it run roughly. Worn spark plugs eat more fuel and cause your car to feel bumpy and more difficult to steer. In fact, bad spark plugs can stop your car from starting up in the first place! So, if steering has become harder or you’ve noticed shorter times between top-ups, it may be time for new plugs. If you need quality parts, you’ll find them through online sources, but make sure you pay them a visit now. Don’t delay repairs or replacements as it can cause a complete breakdown in one of your ride’s system. Master these basic automobile mechanics, and you can make your ride go more than 200,000 miles. Also, keep in mind that every year, car crashes injure and even disable some 2.35 million Americans. These maintenance and repair hacks can help you avoid becoming a statistic. 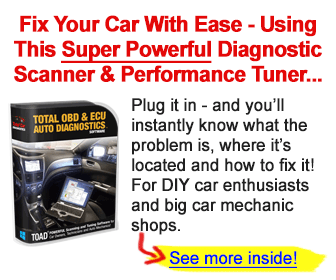 Want to further your basic mechanic skills and perform more advanced repairs? If so, then get started by learning all about car wiring diagrams and electrical symbols!